Nowhere is Whistler’s rich heritage more apparent than in the diversity of options available to you when considering which neighborhood to call home. This list will provide you with an overview including pros and cons, as well as general property values for each of Whistler’s very distinct neighborhoods, arranged from North to South. Whistler’s northern-most neighborhood, Emerald is known for its beautiful, lush environment surrounded by old-growth forest and excellent privacy. Lot sizes also tend to be comparatively large in the same price range as properties closer to the village. Pros: Large lots, comparatively strong value. Whistler’s newest development, Rainbow is perfectly situated on a series of benchlands, allowing for incredible lake and mountain views from nearly every property. The area was mostly clear-cut during construction to help mitigate the risk of fire, but as time passes, the greenery is growing in and Rainbow is a beautiful place to call home. Pros: Exceptional views of Whistler and Blackcomb mountains, all newer construction, walking distance to schools. Cons: Longer drive to the village, and less naturally treed area. One of Whistler’s original neighborhoods, Alpine offers a little mix of everything. With Meadow Park Sports Centre in your back yard, along with elementary AND high schools within walking distance, many Whistlerites have chosen Alpine for it’s family-oriented amenities. Pros: Large treed lots, excellent amenities within walking distance. Cons: Still comparatively far from the village. ‘Nic North’ is a master-planned neighborhood intertwined with the world-famous Nicklaus North Golf Club. If golf is your thing, Nic North offers an incredible blend of convenience and exclusivity. With Meadow Park Sports Centre, Nesters Market, and Scandinave Spa all just a few minutes away, Nic North is a golfer’s dream. Pros: Proximity to golf and other amenities. Cons: Smaller lot sizes, comparatively expensive vs. proximity to the village. Nestled in the trees just south of Nicklaus North is Spruce Grove. With 3 baseball diamonds, a Frisbee golf course, and convenient access to the valley trail, Spruce grove is the perfect choice for an active family. Pros: Excellent access to many recreational facilities, generally quiet neighborhood. Considered by many to be one of Whistlers best-kept secrets, White Gold offers excellent proximity to the village, as well as Nesters Market, along with large lots, old growth trees, and a very peaceful, quiet environment. Pros: Larger lots, very quiet and relaxed. Cons: Higher comparative cost than neighborhoods further from the village. Note: The luxury development of 'Fitzsimmons Walk' is the only townhome development in White Gold and so this data on condo/townhome sold prices reflects higher sold prices. Nester’s is a fantastic neighborhood located just north of the village. Capturing the perfect blend of convenience and privacy, Nester’s is home to many long-term Whistler residents. Pros: Large lots, excellent proximity to the village and other amenities. Directly across highway 99 from Whistler Village, ‘The Cay’ is also known for an excellent balance of convenience and privacy. With a variety of different lot sizes, construction styles, and situational perspective, The Cay offers something for nearly everyone. Pros: Large lots, excellent proximity to the village and other amenities, excellent privacy for many homes. In the heart of it all! Whistler Village features many different townhomes and condos, ideal for full-time residency as well as investment properties for families who may only make it up to Whistler a few times per year. Naturally, properties located in the village are as close to the action as it gets! Pros: Unbeatable proximity to all that Whistler has to offer, including restaurants, shopping, and of course, the lifts! Cons: Higher comparative cost than outlying neighborhoods, less tranquil than properties outside of the village. Situated at the base of Blackcomb Mountain, The Benchlands is within convenient walking-distance to the village, with many ski-in/ski-out options, but with less activity and noise than in the central village. Cons: Higher comparative cost than outlying neighborhoods. Perched high above Whistler Village, Brio is home to some of whistler’s most spectacular properties, along with some outstanding opportunities to acquire lots and existing homes with great proximity to the village, and golf. Pros: Excellent proximity to the village and other amenities, while still maintaining quiet privacy. The exclusive enclave of Blueberry Hill offers a winning combination of spectacular homes, along with stunning views of both Whistler and Blackcomb mountains, Wedge mountain, and the Whistler Golf Course. Blueberry is generally considered one of Whistler’s more exclusive neighborhoods. Pros: Stunning views from many properties, still very convenient access to the village. If year-round adventure is your priority, then Alta Vista needs to sit up towards the top of your list! With excellent proximity to the village [about a 3-minute drive], Alta Vista also boasts access to Alta Lake where your family will enjoy parks, swimming, and spectacular views of the surrounding mountains. Pros: Year round fun with both the ski lifts AND lake life right at your door step. Running along the west side of Alta Lake is Alta Lake Road. While it’s a significantly longer drive to access the village [as you must circumnavigate the whole lake via Alpine or Creekside], these properties all feature lake-front access with some of the most spectacular views anywhere in Whistler. Perched high above Alta Lake Road, you’ll also find the exclusive enclave community of Stonebridge, with vacant lots up to 23 acres still available to create your own little piece of paradise. Pros: Stunning views from every property, lake front access. Cons: Significantly longer drive to the village compared to other more central neighborhoods. Note: The Stonebridge development is included in these figures and so the high end of the market is drastically affected in terms of averaging these figures for properties on the west side of Alta Lake. Situated between Whistler Village and Creekside, you’ll find the lovely heritage neighborhood of Nordic Estates. With larger treed lots, as well as many ski-in / ski-out properties offering access to the Creekside gondola, Nordic is a beautiful part of Whistler with convenient access to many amenities. Creekside is where it all began! Long before Whistler Village and Blackcomb Mountain were even on the map, Whistler’s original pioneers were skiing and socializing in what we now call ‘Creekside’. Home to many beautiful chalets, townhomes, and condos, Creekside is a beautiful, more relaxed alternative to life in The Village. Our Thornhill Group offices are also located in Creekside, so do stop in and say hi when you’re in the area! Pros: Convenient access to the Creekside gondola as well as fantastic amenities including restaurants, lakes, shopping, and more. Cons: Higher comparative cost than outlying neighborhoods, and a longer drive to Whistler Village. Bayshores is one of Whistler’s best-kept secrets. Home to many exquisite chalets, townhomes, and condos, Bayshores offers a tremendous balance of privacy, solitude, and convenience – which is why I choose to make my home in Bayshores! Pros: Convenient access to Creekside, very quiet, family-focused neighborhood. Pros: Very exclusive properties in Whistler’s pre-eminent master-planned luxury enclave, ski-in / ski-out access to Creekside, and a private gondola! A neighborhood known for family activity, Spring Creek is home to Spring Creek Community School, along with hiking trails, and convenient access to the lifts at Creekside. Pros: Excellent amenities to benefit young families, lower comparative prices. Cons: Longer drive to Whistler Village, smaller lot sizes. Originally built for athlete accommodations during the 2010 Olympic Games, Cheakamus Crossing features a host of beautifully well-appointed townhomes and condos, and in recent years, has seen the development of many stunning chalets as well. With a high level of development currently underway in Cheakamus, the future looks very bright! Pros: Excellent value in newer construction townhomes, condos, and chalets. Located about 20 minutes south of Cheakamus Crossing on Highway 99, you’ll find the quaint and desirable neighborhoods of Black Tusk Village and Pinecrest Estates. Offering tremendous value, and convenient access to both Squamish AND Whistler, Back Tusk and Pine Crest are an excellent consideration for any buyer looking to move their Whistler dream a little closer to the city. Pros: Very quiet and relaxed environment. Nearly 30 minutes closer to Vancouver than Whistler Village, and excellent comparative value. Cons: Longer drive time to ski in Whistler. It was fishing that drew the first tourists to Whistler – to Rainbow Lodge on Alta Lake to cast for trout with legendary guides Alex and Myrtle Philip. By the early 1920s, Rainbow Lodge was the most popular summer destination west of the Rocky Mountains. In 1960 a group of Vancouver businessmen, led by Franz Wilhelmsen, formed Garibaldi Lifts Limited with the aim of developing an alpine ski area on London Mountain (across the lake from Rainbow Lodge). Their dream was to host the 1968 Winter Olympic Games. While it would take another 50 years and four Olympic bids before Whistler would realize its Olympic dream, Wilhelmsen and his cohorts pursued their ski area plans with great vigor. And so it was that London Mountain was soon renamed Whistler Mountain (in honor of the local alpine marmot, who "whistles" when it communicates) and officially opened to the public in February 1966 at the current Whistler Creekside base. Boasting the biggest vertical drop in North America and a ski season that stretched from early November until late May, Whistler Mountain opened with a four-person gondola, a double chairlift, two T-bars, and a day lodge, and virtually re-invented the modern ski experience... But there was still more to come. 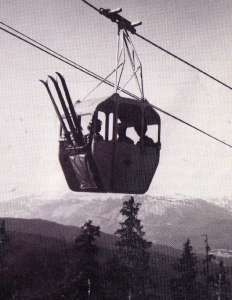 When neighboring Blackcomb Mountain opened for business on December 6, 1980, it featured 5 triple chairs and an additional 1,240 vertical metres (4,067 feet) of skiing. Whistler Mountain responded by developing a whole new network of runs on its northern flank. Independently owned, the two mountains cultivated a healthy rivalry. When Blackcomb installed the 7th Heaven T-Bar, for instance, providing visitors with a vertical mile (1,609 metres/5,280 feet) of skiing, Whistler Mountain responded with the Peak Chair, a high alpine lift that increased its vertical to 1,530 metres (5,020 feet). Between the two mountains, skiers and riders had lift access to three glaciers and at least a dozen alpine bowls. Suddenly, big-mountain skiing was no longer exclusive to the European Alps. Meanwhile, a modern new community, Whistler Village, had sprung up on the bench between the two areas. In 1991, Whistler Resort became the first mountain resort outside of the USA to be named No. 1 by a major American ski magazine. Five years later, in 1996, it became the only resort in history to be simultaneously named No. 1 by Snow Country, SKI and Skiing Magazines (and went on to be named No. 1 by Skiing Magazine for 13 years in a row). But the biggest news was yet to come. In March 1997 Whistler Mountain Ski Corporation (which owned Whistler) and Intrawest Corporation (which owned Blackcomb) merged to create one of the biggest and most exciting mountain resort companies in the world. As if to underscore that claim, local rider Ross Rebagliati become the world's first snowboard gold medalist at the Nagano Olympics in 1998. He joins snowsport heroes such as Steve Podborski, Rob Boyd, Eric Pehota, Brian Savard, Victoria Jealouse, Britt and Michael Janyk, Ashleigh McIvor, Maelle Ricker and many other champions who have chosen to make their home here in Whistler. Never one to rest on its laurels, exciting new announcements continued to come forth. A whole new village at Whistler Creekside, the original base area, began development in the spring of 2000, including the launch of a new day lodge and the long anticipated re-opening of an all-new Dusty's Bar – now as famous for its BBQ offerings as it is for its sun-splashed après-ski parties. In 2004, Whistler Mountain added 1,100 acres of 'inbounds backcountry' terrain with the addition of Flute Bowl, bringing the total acreage across both mountains to 8,171 acres. And in 2006, a new high-speed quad chairlift was added in Symphony Bowl, creating the Symphony Amphitheatre and bringing lift access closer to the top of Flute Bowl. Now with that in mind, remember: Whistler Blackcomb is not just about innovation in engineering. Since 1992 Whistler Blackcomb has been focused on the development and execution of an environmental management strategy with the goal of developing a model of environmental and social stewardship for ski and mountain resort operations. Since that time, the company has been recognized for its efforts with countless awards, and has the honor of being named one of Canada's Greenest Employers [2009, 2010, 2011]. The Fitzsimmons Creek Renewable Energy Project was launched in December 2009 in partnership with Innergex Renewable Energy and Ledcor Power Group and is a significant addition to Whistler Blackcomb's existing efforts towards reducing its energy consumption and waste. The Run-of-River project is powered by the Fitzsimmons Creek and is located entirely within Whistler Blackcomb's operating area. It can produce up to 33 gigawatt hours of hydro electricity per year, which is the equivalent of powering more than 3.000 homes or the ski resort's year-round operations, including 38 lifts, 18, restaurants, and 270 snowguns. Of course, the crowning glory came when Whistler Blackcomb played host to the world as the official alpine skiing venue for the 2010 Olympic and Paralympic Winter Games. A dream 50 years in the making will be celebrated for many decades to come. Constantly on the leading edge of innovation, Whistler Blackcomb has also developed and made public a number of documents outlining proposed future development plans for the resort and surrounding region. Let’s just say... The future looks very bright!